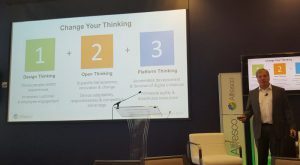 In the research John shared, the fast growing organizations focused on all three in their digital transformation efforts. This does not surprise me. All three are key components of the most successful information management solutions TeraThink has delivered. As such, it is worthwhile to break them down a little further. I’m a big believer in design thinking and work with the OpenIDEO DC chapter to improve my skills. 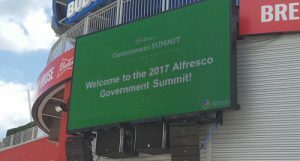 The inclusion of design thinking by Alfresco is a good step forward for the information governance industry. This was a trend at the Information Governance Conference back in October and it is refreshing to see vendors embracing the concept. John noted that in the study, among fast-growing organizations 85-90% of them used each of these principles. Less than 70% of the other organizations leveraged these open principles. That makes sense as being able to readily connect systems allows for an organization to quickly respond to a changing environment. This rapid, agile, response allows organizations to take full advantage of opportunities as they arise. 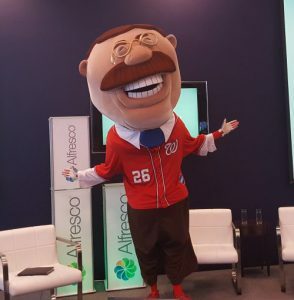 I want to point out that Alfresco is an OSS vendor who has made significant investments in open standards. While this is clearly no coincidence, it is important to note that TeraThink has seen the same correlation on projects with OSS components. A platform is a plug-and-play business model that allows multiple participants (producers and consumers) to connect in a shared environment, interact with one another, and create and exchange value. The definition is dead-on. In the information governance industry, the platform has too often meant an entire ECM stack and not what it really is, Something on which to build solutions. By shifting to content services for delivery, ECM can deliver value as a platform and allow real progress to be made. After John finished, there were some good panels, especially one focused upon Modernizing Records Management and the 2019 NARA (National Archives and Records Administration) Mandate. Lisa Haralampus, NARA’s Director of Records Management Policy and Outreach, was excellent, as were her fellow panelists. I will likely write a post later devoted to the future of records management in the Federal government based upon her comments. I had to depart after lunch in order to visit a client. It was a tough decision considering the quality of the afternoon speakers but our clients come first. Still, it was a good day. I’m looking forward to seeing how some of the conversations play out when applied in the real world. If you’d like to talk about the different pillars of digital transformation and how Design Thinking may be the key that makes open and platform thinking work, drop us a note or leave a comment below.